Saturday was one of those days that I will always remember. 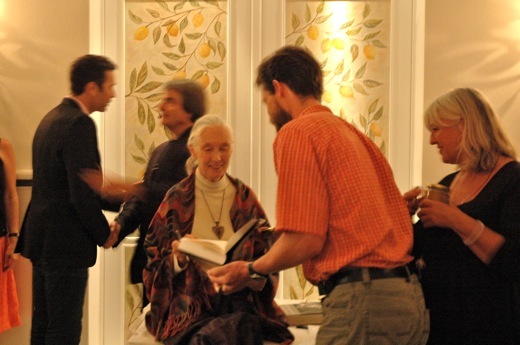 I was able to see Jane Goodall live at an event called “An Evening With Jane Goodall”. It was a magical evening that left me with a warm feeling of joy and inspiration. Years ago, the first thing that would come to my mind when hearing the name Jane Goodall, was her work as a primatologist. I connected her name with a person that had done research on apes, living in the wild and is still known today for her great achievements for the understanding of chimpanzees. This fact is very true and that alone would make her my “hero”, but after having studied her and her life more, I realized that she has become so much more than that. She gave up a peaceful life in the forest of Gombe to become an activist that would fight for a better world. 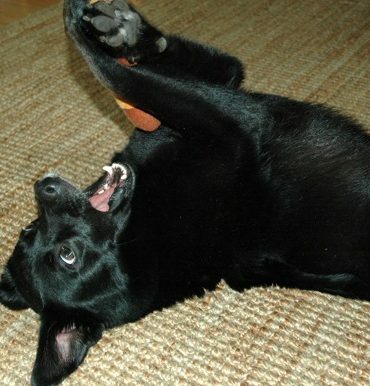 Her work today involves the whole connections between human, the environment, nature and animals. Thus she is supporting and constantly creating projects all around the world, that will help to create a better world. A person of true inspiration that we can all learn so much from. Today she is 77 years old and still travels about 300 days a year to spread the message of change and hope. 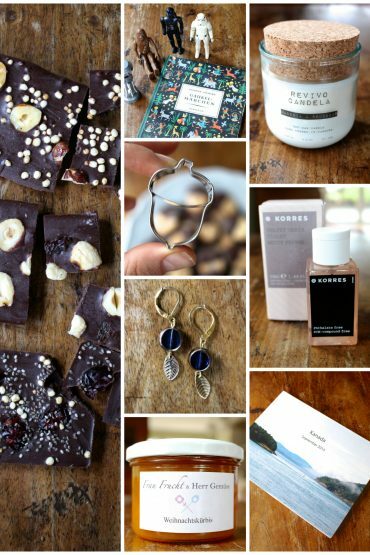 And one of these stops she made in Germany this weekend. 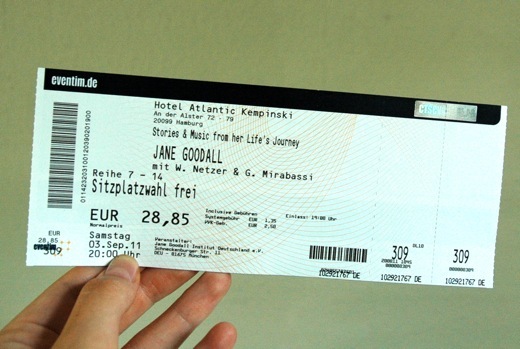 When I heared that she would come to Hamburg, I didn’t think twice about getting a ticket for her charity evening. The reason for her coming was that she had been announced as the international ambassador of Hamburg, the European Green Capital 2011. 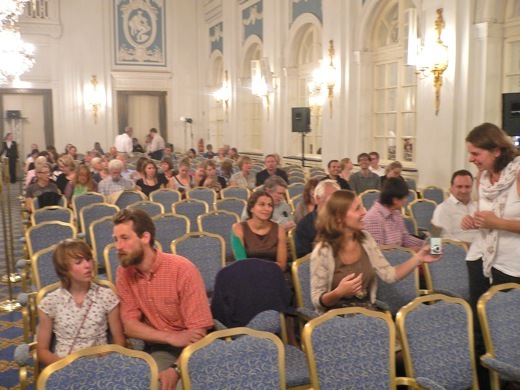 The charity evening took place in the Atlantic Hotel. 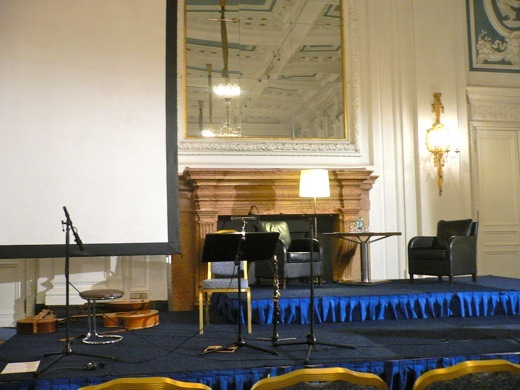 This is the hall and the stage where it took place. The hall of Atlantic Hotel. This is only half of the room. This is where Jane and the musicians would sit. On the left you can see part of a big screen. As Jane walked into the room, the whole audience stood up and applauded her. It was a very sweet moment and I have to be honest that I had tears in my eyes. 🙂 There she was, seeming almost fragile but at the same time so strong and shining. The way she moved, talked and smiled reassured me, that she was a very humble and kind person with a gigantic heart. After all of the terrible things she must have seen around the world you would expect her to be somewhat depressed or angry or maybe even a bit hopeless, but she is the complete opposite. She somehow managed to keep a bright light in her that makes her believe in the good so strongly that everything she says and does resonates love and hope. There is no bitterness in her smile, no sadness in her words when she speaks about her life and experiences. That impressed me a lot and also reminded me of a quote from Martin Luther King Jr. that I like very much: “Darkness cannot drive out darkness; only light can do that. Hate cannot drive out hate; only love can do that.” Jane embodies this quote and I think this is one of the things that is so important to have when you want to create a better world. I really enjoyed the way the evening was concepted. It was a mix of Jane speaking and music. While Jane spoke about her life, problems in the world and ways to approach them, clippings of her latest movie “Jane’s Journey” were shown on a big screen. And inbetween there was live music played by two great musicians that also made the score music for the film. Wolfgang Netzer on the guitar and Gabriele Mirabassi playing oboe. It was beautiful music and it was nice to have these music pieces between Janes talk, so that anything that she had just said could really sink in. Jane said that she often tries to bring the arts together with the environmental work, because she believes that arts like music are not only something fundamental in all of us, but also uplifting, cheerful and inspiring. 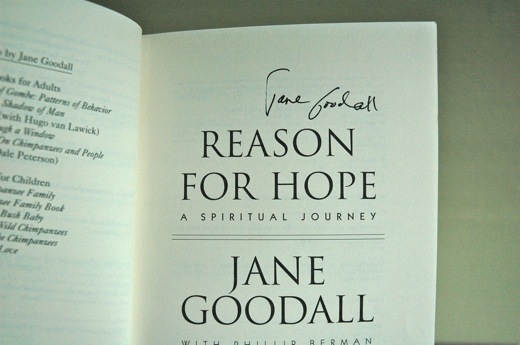 After the event on stage, Jane was so kind to sign books and made it possible for everyone to meet her in person. That was another thing that impressed me. 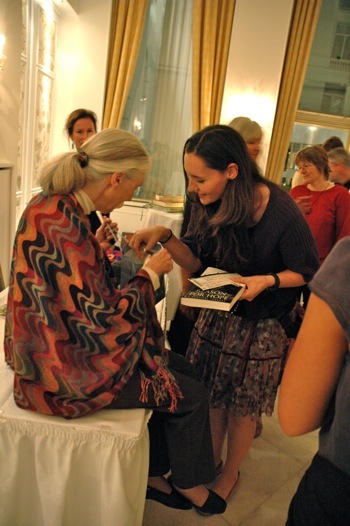 She would sit there on a table for two hours, after having a long day, and signing books until the last one got his/her autograph. I could tell that she was very tired and I almost felt bad to also stand in the line for an autograph. But when I talked to her, I realized that this is something that keeps her going. 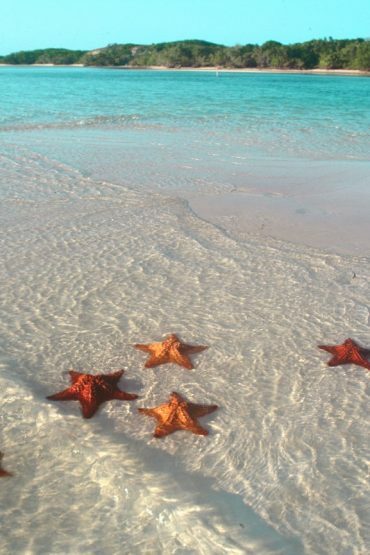 Knowing that she will inspire another person to follow her believes must be something like a motor for her. Eventhough she is 77 years old she doesn’t make the impression that she ever wants to stop what she is doing. 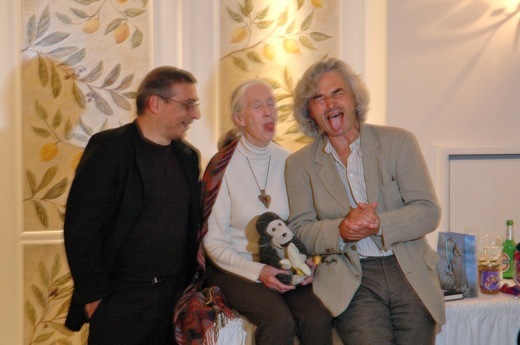 This is Jane posing for a funny picture with the musicians. This is me giving a little gift and a letter to her. 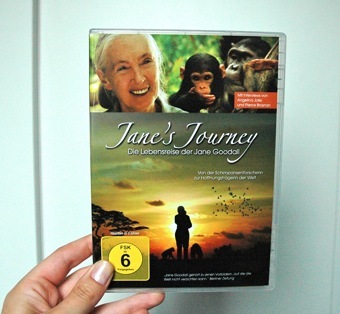 I really want to recommend the movie “Jane’s Journey” if you want to do so (it’s also available in Germany). You will be amazed by the stories of her life and the variety of her projects – and this movie is just a small insight. The topics shown on the DVD are more or less the ones she talked about in her charity event. That way you will get an even better idea what the evening was about. 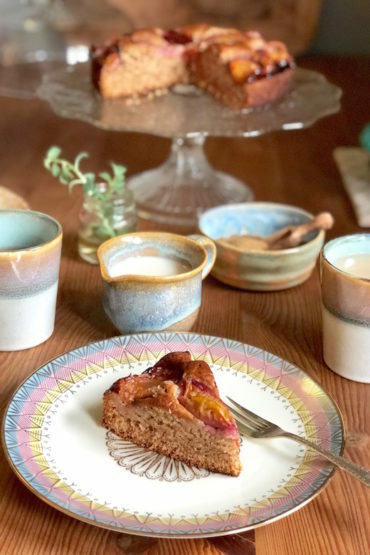 This has probably been the longest post so far – thank you for reading all the way to here. 🙂 Have a great start of the week everybody! You just made my day Eval! 🙂 Thank you for your kind words. I\’m really glad that my blog cheers you up. That is what it\’s all about – love & happiness! Sending a big hug to Hungary! Too bad I missed this event. Must have been great! Thanks, I\’ll watch out for her!